The aerial footage from a 4k drone is without doubt just stunning. Today, we review the 12 best 4k drones on the market. We also take a quick look at 4k camera technology and the real benefits to filming with a 4k drone camera. These 4k drones equipped with ultra high definition video cameras are capturing spectacular videos. All of the 4k drones featured below have advanced features such as precision stabilization along with autonomous flight modes such as follow me, orbit, waypoints and active tracking to make filming easier. There are also a number of 4k drones with obstacle detection and collision avoidance. 4k video recording cameras on drones is becoming the standard entry point for professional aerial filming. In 2016, we started to see the first of the 4k drone cameras coming to the market. 2017 produced a number of 4k video recording drones. 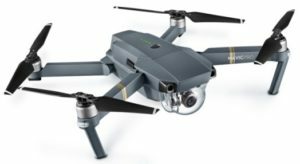 Now, in 2018, we have a number of drones with 4k cameras including the latest DJI Mavic Air. 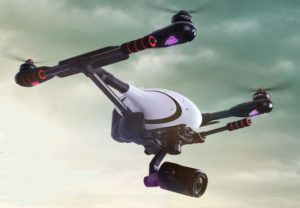 A video camera drone with 4k ultra high definition resolution is defined as a display with at least 8 million active pixels, with the lower resolution boundary being at least 3,840 x 2,160. So, if you own a 4k drone, this will deliver a massive four times as much detail as 1080p full HD. That is eight million pixels compared to two million pixels. When it comes to 4k video cameras, there are multiple varieties of 4k digital content ranging from 3,840 x 2,160 to 4,096 x 3,112. However, the 3,840 x 2,160 resolution is the most consistent video recording mode used by most drone manufacturers such as DJI, Yuneec, GoPro, Hubsan and Walkera. It is also the most common video recording mode from UHD/4k HD TVs and monitors. The 3,840 x 2,160 doubles the horizontal and vertical pixels offered by 1080p (1,920 by 1,080 pixels) which is the current standard for high definition. However, there are also 4k drones which you can film in 4096 x 2160. The DJI Inspire 2 uses a new CineCore 2.0 image processing system, capable of recording 5.2k videos in CinemaDNG, Apple ProRes and more. This drone is for creating Hollywood quality film. It even comes with a ground gimbal so you can film both aerial and ground shots with the Inspire 2. Photographers who routinely view their work on a HD TV are seeing only a fraction of the detail inherent in their pictures when they view them at 2,160p. A 4k display reveals so much more nuance and detail. The higher resolution images are simply way better. 4k Ultra High Definition isn’t just about quadrupling resolution, it also supports faster frame rates, insane contrast dynamics and extended colors. According to research by the EBU and the BBC, viewers are equally receptive to high native frame rates (up to 100 Hz), because images are perceived to be more naturalistic and detailed. If you are filming with a 4k video camera drone, it is also ideal to have a 4k display for viewing to get the full resolution, sharpness and overall superior film. Most 4k drone video playback is displayed on a TV which only has HD or less resolution. Playback of your outdoor drone adventure or vacation on an ordinary screen is fun and convenient, but you are only seeing a fraction of what’s present from a 4k image. A 4k TV with ultra high definition JPEG playback will reveal four times the picture information. It’s like seeing your photographs again for the first time. The higher pixel density of a 4k panel also enable you get much closer without the grid like structure of the image itself becoming visible – this means you can comfortably watch a much larger screen from the same seating position as your current Full HD panel. Now, take a look at the below spectacular aerial film captured with a 4k drone. This 1st video was filmed with a Phantom 4 Professional in 4k resolution. The location for this stunning scenic video is beautiful New Zealand. At a minimum, shooting video in 4k UHD, provides a future proof master copy of your footage should 4k truly take off as a mass-market phenomenon (in a way that 3D has not). Even if you deliver the final video in HD, dealing with a higher resolution 4k master file gives you greater latitude to re-frame, zoom and manipulate your footage without degrading video quality. Increased fineness and contrast is then possible with output to DVD and Blu-ray. Some cinematographers choose to record at 4k when using the Super 35 film format to offset any resolution loss which may occur during video processing. Below I have details of the best 4k video recording drones. These are all top quality with plenty more excellent features along with having 4k video cameras. These drones all have precision stabilization and have many autonomous flight modes which allow you to concentrate on aerial filming and photography. Flight modes such as waypoint navigation, points of interest, follow me, watch me, orbit and tracking modes. These drones all have the very best in fail safe flying systems. Another feature of theses drones is that they are all very easy to fly. In our article entitled how to fly a quadcopter, we have excellent videos which show you just how easy it is to fly these latest drones. 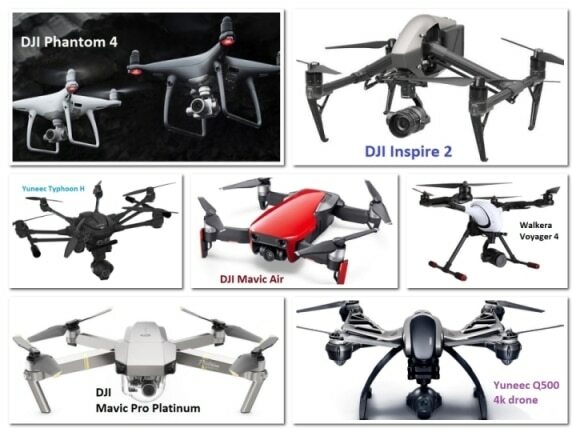 Below is a quick review of the following top 4k drones along with some nice videos. The new Mavic Air 4k drone is the first major release of 2018. Again, DJI have come up with another beautifully designed quadcopter. The Mavic Air’s elegant design makes it very portable. It is smaller than the DJI Spark when folded. However, when unfolded, it is bigger than the Spark. It’s technology is a huge jump on the DJI Spark. DJI ActiveTrack technology is taken to a new level on the Mavic Air. It can sense up to 16 objects, which you can then choose the right subject to track. It easily follows targets whether they are running, jumping or cycling. .
It’s camera captures seriously professional 4k video at 30 frames per second, recording at 100 megabytes per second to capture every second in ultra high definition quality. You can also record high speed adventure and sports as the Mavic Air support recording 1080p at 120 frames per second. DJI keep breaking into new grounds of drone innovation both in their drones, gimbals and also their cameras. With the Mavic Air, DJI introduced new HDR algorithms to obtain the correct exposure settings intelligently according to the lighting conditions. Overexposed or dark areas are processed for more natural transitions between highlights and shadows, while DSP acceleration allows for more efficient shooting. The Mavic Air can stitch 25 photos together in just a few seconds to create a stunningly clear sphere panorama. The Mavic Air is a terrific quadcopter and has all the latest features. You can read further on the many features of this quadcopter in our quick Mavic Air review which also includes the best Mavic Air combo and bundles deals. The Inspire 1 is without doubt one of the best drone to date. It is high tech with plenty of new patented technology. Now, this quadcopter allows you to shoot up to 4k UHD video at 30 frames per second. You can also capture 12 megapixel photos with the Inspire 1 camera. The lens consists of 9 separate elements, including an aspherical element, for extreme clarity, while Adobe DNG RAW support gives you the power to make every shot a masterpiece. The rectilinear, curved lens design eliminates distortion such as barrel fisheye effect and the 20 mm focal length opens up your shots to a remarkably wide angle without that fish-eye look. The Pro model comes with the Zenmuse X5R which is the world’s first Micro Four Thirds aerial camera capable of recording lossless 4k videos in RAW. With a frame rate of up to 30 fps and 1.7 Gbps average bitrate allows you to capture breathtaking video footage every time. Note: Read a full Inspire 1 review on this highly innovative drone. The Inspire 1 is also adaptable for many other DJI Zenmuse gimbals including the Flir Thermal Vision Camera Gimbal. Here is a spectacular 4k UHD video shooting in the Maldives. This was filmed with the awesome DJI Inspire 1. The Phantom 4 Pro video recording drone captures stunning 4k UHD video. You can also take 20 megapixel still shots. This 4k drone has many intelligent flight modes which allow the drone to fly autonomously freeing you to concentrate and work the 4k video camera. The Phantom 4 Pro has exceptional flying stability giving you the sharpest of 4k video. Another, great feature of the Phantom 4 Pro is that it can detect obstacles in 5 directions and then take the necessary action to either fly over, around or hover in front of the object. This collision avoidance technology in the Phantom 4 Pro uses Vision, Ultrasonic and Infrared sensors. It really is terrific technology. Flying a drone and working the camera at the same time can be quite difficult. While it is terrific to have a 4k drone, you still need to be able to concentrate on your video filming angles and shots. This can be very difficult and it is the best reason to own a 4k drone with autonomous flight modes. The Phantom 4 Pro comes come with all the following autonomous and intelligent flight modes which make filming very easy. These modes work with the obstacle sensing and vision positioning technology which means, that while you are concentrating on getting great 4k aerial film and still photos, you won’t crash into something. You can read further and watch videos of the all the Phantom 4 Pro Intelligent Flight Modes here. It has a max video bitrate of 60 Mbps. Photos formats in JPEG and DNG (RAW). With video you can save in MP4 / MOV ( MPEG – 4 AVC / H.264 ). The DJI Phantom 4 is a terrific quadcopter and it the 1st choice for many Professional Aerial Photographers. There are also some terrific Phantom 4 bundle offers available at the moment. Here is some very scenic 4k UHD aerial shooting with the latest Phantom 4. It films with exceptional quality. The Mavic is DJI’s first foldable, fully portable aerial camera system. It is almost small enough to fit in your pocket. With a 4K UHD camera, obstacle avoidance, super stable flight stability, intelligent flight modes for filming and safety, this makes the Mavic Pro the most advanced drone you could ever fit into your backpack or shoulder bag. The Mavic Pro has the following autonomous flight modes to make filming with this 4k drone very easy. Note: Read more in this excellent article entitled Mavic Pro Highlights and FAQs which shows you around this very high tech portable 4k UHD video drone. The DJI Mavic Pro is perhaps the most popular drone. It is super easy to fly. It flies super smooth even in strong winds and films beautifully. It can be used for aerial filming, site surveying and 3D photogrammetry. Now, here is a terrific DJI Mavic Pro 4k video which shows off really how great this small quadcopter is. The DJI Inspire 2 quadcopter was designed specifically for professional film making. It was used for all the aerial and ground shots is this Hollywood cinematic quality film called The Circle. Now, the Inspire 2 drone is many times better at aerial photography and filming than any other drone in this article. It films superbly and produces exceptional quality film when comparing it with drones which are many times more expensive. The Inspire 2 has a new CineCore 2.1 image processing system, which records up to 6k in CinemaDNG RAW, 5.2k in Apple ProRes and more. Increased intelligence adds multiple intelligent flight modes, including Spotlight Pro, giving even single pilots the ability to create complex dramatic shots. The Inspire 2 goes from 0 to 50 mph (80 km/h) in just 5 seconds and hits a maximum speed of 58 mph (94 km/h) and has a max descent speed of 9 meters per second for unheard of speed and agility in an aircraft this size. A dual battery system prolongs the flight time to a maximum of 27 minutes (with an X4S), while self-heating technology allows it to fly even in low temperatures. Flight Autonomy has been revised and developed specifically for the Inspire 2, providing two directions of obstacle avoidance and sensor redundancy. The Inspire 2 has a number of compatible Zenmuse camera options. For professional aerial imagery and film making, the Inspire 2 cameras are the Zenmuse X5S and Zenmuse X7. Now, lets take a quick review of both the X5S and X7 for the Inspire 2. Both cameras use the Inspire 2 image processing system called CineCore 2.1. The Inspire 2 creative workflow is now optimized and is capable of recording video in CinemaDNG and Apple ProRes along with other common formats for post production in film making. CineCore 2.1 supports burst shots, capturing 10 JPEG + DNG bursts and continuous DNG bursts at 20 frames per second (24 megapixel per shot) when the Zenmuse X7 is mounted. CineCore 2.1 is currently compatible with the X7 and X5S cameras. The Zenmuse X5S camera is equipped with a Micro 4/3 sensor and has a dynamic range of 12.8 stops, with a much improved signal to noise ratio and color sensitivity over its predecessor, the X5R. This X5S camera supports up to eight standard M4/3 lenses (including zoom lenses) with focal lengths ranging from 9 mm – 45 mm(equivalent to 18 mm – 90 mm on a 35 mm camera), allowing for more creative flexibility. 5.2k at 30 frames per second in CinemaDNG video and Apple ProRes video. 4k 30 frames per second using H.265 (both at 100 Mbps). Since it uses a standard Micro 4/3 mount, the Zenmuse X5S now supports up to eight professional lenses with focal lengths ranging from 9 to 45 mm (equivalent to 18 mm to 90 mm on a 35 mm camera), providing more creative control over the final look of a shot. Here is a quick video where producers of the short film called The Circle describe how they used the Inspire 2 and X5S camera throughout. The Zenmuse X7 is a compact Super 35 camera with an integrated gimbal made for high end film making. The DJI X7 camera delivers stunning resolution and image quality. This Zenmuse X7 has a 24 megapixel CMOS sensor rated at 14 stops of dynamic range to preserve astonishing detail along with offering both 6k resolution in CinemaDNG and 5.2k Apple ProRes. The X7 camera support for continuous RAW burst shooting at 20 frames per second and 24 megapixel stills. The X7 has the new DL-Mount, which is the world’s first integrated aerial lens mount. This allows for quick switching between 4 available prime lenses. For seamless editing, a new DJI Cinema Color System preserves accurate colors for easier post processing. Taking advantage of new technology, the X7 sensor features thinner interconnections, allowing light to reach the sensing area via a larger incident angle for increased photo sensitivity. This enables a more compact lens mount to be used on this sensor, while maintaining excellent image quality. The flange focal distance of the DL-Mount is less than 17 mm. This compact mount means that the X7 weighs only about 1.4 lbs (630 grams) with a lens attached. Together, the X7 and Inspire 2 weigh around just 8.8 lbs (4 kg) and has the ability to capture the same challenging shots as more heavy duty drones weighing up to 88 lbs (40 kg) and for much less. DJI offers four Zenmuse X7 prime lenses for the DL-Mount system, with focal lengths ranging from 16 to 50 mm and resolutions of up to 8k. These four prime lenses for the Zenmuse X7 are made of lightweight carbon fiber and designed by world leading optics teams. The four lenses have been embedded with advanced technologies crafted specifically for the X7 high end image sensor. This next video is the actual launch of the Zenmuse X7 on the Inspire 2. It shows the Zenmuse X7 on the Inspire 2 being used to film both indoors and outdoors with superb quality and vivid colors. To unlock the wide ranging possibilities of DJI professional imaging systems and open more room for post-processing aerial photography in film making, DJI designed a new DJI Cinema Color System. This color system consists of a new D-Log curve and a D-Gamut RGB color space. The D-Log can encode 15 stops of dynamic range, two stops higher than the CineCore 2.0. Even in poor light conditions, the X7 can still preserve stunning detail in shadows and highlights, leaving more room for post production creativity. D-Gamut covers the entire DCI-P3 color space commonly used in film making. Tailored for aerial cinematography and stills photography, D-Gamut provides larger green tone coverage, delivering beautiful green gradation for your shoots. D-Gamut also offers optimized skin tone adjustment by moving these tones to the most suitable chromaticity, ensuring vivid colors are reflected from every inch of skin. By applying the dedicated 3D-LUT in color grading, skin tones will softly transition, even with wide exposure differences. When designing D-Gamut, DJI considered manual color grading, preventing skin tones from turning yellow when editing without 3D-LUT or color management. Here is a terrific hands on look at the top DJI Inspire 2 video camera drones. This films not just in 4k but 5.2k and 6k with the Zenmuse X7. It is totally wow. You can find the best DJI Inspire 2 bundles here. The Typhoon H video camera drone is the latest multirotor from Yuneec. For its compact size, it is perhaps the most advanced multirotor for aerial photography and videography available. 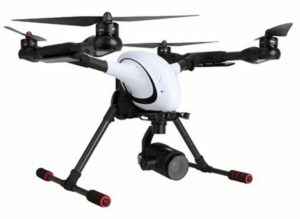 It is equipped with six rotors, a 360-degree gimbal camera and retractable landing gear. It is also very easy and safe to fly with the latest collision avoidance sensing system. The 3-axis anti-vibration CGO3+ gimbal camera captures ultra-stable 4k Ultra High Definition video, vivid 12.4 megapixel still images and can be rotated through an unlimited, 360° range of motion. Typhoon H multirotor offers flight time of up to 25 minutes. The Android powered ST16 Ground Station features a 7-inch touchscreen that displays live footage of your flight in HD 720p resolution and enables a wide variety of autonomous flight modes. The following autonomous flight modes make the Yuneec Typhoon H very easy to film with. This allows you to concentrate on getting the best video. Orbit Me: Flies a circular path around you, keeping the camera trained on you the whole time. Point Of Interest: Select a subject and Typhoon H will orbit that subject autonomously. Journey: The multirotor will go up and out, as far as 150 feet, and capture the perfect aerial selfie. Curve Cable Cam: Program an invisible route for this drone to fly along. The Typhoon H will fly between pre-set coordinates while independently controlling camera position. Follow Me / Watch Me: Follow Me ensures that this multirotor moves along with you. Watch Me tells it to follow you while always pointing the camera at you wherever you go. The Yuneec Typhoon 4k video recording drone is an all in one package with an included Android touchscreen controller. This means faster setup and no need to add your own mobile device to capture impressive 4K videos. The Typhoon Q500 4K quadcopter also captures 1080p at 120 frames per second slow motion video with a full complement of manual camera settings for total creative control. Perfect ground shots are also available with the included Handheld SteadyGrip™. The CGO3 camera is no ordinary camera: the integrated 3-axis gimbal allows smooth shots in incomparable 4K and photos with 12 megapixels. The CGO3 camera with distortion-free 115° lens allows realistic shots. A digital video down-link will make sure that you can see and follow the live images from the camera via the remote control of your Yuneec copter or directly via your smartphone by using the free CGO app. You can read and watch some fantastic video footage in this full Yuneec Q500 4k review. The Mantis Q quadcopter is the latest pocket sized quadcopter from Yuneec. It is also light with a total weight of less than 17 ounces (480 grams). It is packed with super technology including 4k video camera, superb stabilization, face detection and voice control. This Mantis Q has a terrific flying time of 33 minutes. In sports mode, the Mantis Q can fly at a top speed of 44 mph (72 km/h). This DJI Mantis Q flies superbly to your touch and it is incredibly agile. The Mantis Q also uses both GPS and GLONASS to pick up plenty of satellites. Using its Indoor Positioning System, the Mantis Q can fly safely and very stable at speeds of up to 9 mph (15 km/h) indoors, where there is no GPS nor GLONASS satellites available for positioning. You can check the current location of the Mantis Q at any time via a map displayed in the app (map display requires an Internet connection). Journey – the Mantis Q will fly upwards on a linear path and then return automatically – making for the perfect shot. Point of Interest – Select an object while in POI (Point of Interest) mode and the Yuneec Mantis Q will circle this object automatically. Return Home – With a push of a button, the Mantis Q will automatically return to a point near takeoff area and land by your side. When activated, the face detection system let the Mantis Q take a picture of you as soon as it sees your face in a distance of up to 13 feet (4 meters). The Mantis Q is the first camera drone from Yuneec, which can be intuitively controlled by voice command. Whether starting, landing or taking photos and videos, commands such as “Come back” and “Start recording”, the Mantis Q can be easily controlled via voice commands. A list of voice commands can be found in the settings of the Yuneec Pilot App by clicking on the “i” next to the menu item “Voice Control”. Here is the technical details of the Mantis Q drone camera. Now, here is a very nice introduction to the Yuneec Mantis Q 4k travel drone. The Voyager 4 is the latest professional drone from Walkera. Walkera use both GPS and GLONASS dual navigation systems which pick up more satellites and enable more accurate signal receiving and location. The Voyager 4 has a 3 axis brushless gimbal to enable a more stabilized footage. 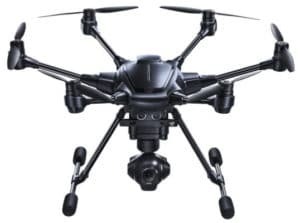 It uses an advanced shock absorption gimbal technology which greatly reducing vibration and movement during flight ,enabling the camera to capture stabilized and fluid footage even after magnifying the focal length. This Walkera Voyager 4k drone has an amazing 18x optical zoom lens which is pretty outstanding. Here are just a few of the camera features. Visit the Walkera Voyager 4 web page for more information. This Walkera Voyager 4k drone has the following intelligent flight modes for both safety and easy of flying. This 4k drone has many more tremendous features and you can read more in this excellent Walkera Voyager 4 review. The Vitus is the latest mini drone with 4k aerial camera just released by Walkera. It comes with dual mode global positioning satellite system. This 4k drone has exceptional design in that the quadcopter arms, landing gear and propeller blades can be folded. It is small and weighs less than 1lb. For such as small drone, it is hard to believe they could fit in the collision avoidance technology. But they did. The Walkera Vitus comes with Time Of Flight (ToF) technology and 3 high precision sensors to avoid obstacles in the front, left and right. The camera support 4k at 30 fps and 12 megapixel for still images. You can also shoot 1080p at 60 fps. The 85 degree ultra low distortion wide angle lens helps to keep the original details and gives very share and deep color to your aerial film. For precision stability, this 4k drone comes with a miniature sized 3 axis stabilization gimbal. The Autel Evo 4k drone is a very easy to fly quadcopter, including flying indoors. The EVO has a long flight time of 30 minutes and a 4.3 mile (7 km) video range. This Auto Evo 4k drone has some excellent technology with Dynamic Track, Obstacle Avoidance and 3D Mapping technology and more. EVO includes a remote controller, with a a 3.3 inch OLED screen, providing you with critical flight information, or a live 720p HD video feed letting you see the camera view, without the need for a mobile device. The Evo has an integrated advanced computer vision system, which provides forward obstacle avoidance and rear obstacle detection. The bottom facing sensors allow for more accurate landings and stable indoor flights. The superb Autel Evo quadcopter has a low price of under USD 995 on Amazon. There are also tremendous bundles offers, with the best Autel Evo bundle prices around the USD 1095. The Autel Evo is equipped with a powerful aerial camera on a 3 axis stabilized gimbal, which records video at 4k resolution up to 60 frames per second and a recording speed up to 100 mbps in H.264 or H.265 codec. It uses a real glass optics lens which captures stunning aerial photos at 12 megapixels with a wide dynamic range for more details and color. Now to finish off this post, here is a some footage and testing of the Autel Evo.